Take a trip to Seal Island, catching a glimpse of these wonderful animals at play and at rest. 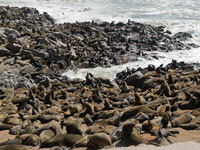 Although several tiny islands off the coast are unofficially part of Seal Island, the most well-known is Duiker Island. Located a small distance out from Hout Bay, boats regularly leave the docks and take passengers outside the harbour and into the ocean. From here, they can enjoy sweeping views of Hout Bay, Noordhoek, Kommetjie, and the famous Chapman's Peak. The boat stops just below the Hout Bay Sentinal, hunders of Cape fur seals basking on the small island in the sun. The sight is magical, if a bit pungent. It is truly a privilege to see these creatures in their natural habitat. Many of the boat tours use glass-bottomed vessels which allow sightings of the seals zipping about beneath the water. The charming naval harbour of Simon's Town has a colony too, with tours also leaving its shores. The great white sharks that frequent the False Bay region often lurk hungrily around the islands. Sightings of these awesome apex predators are possible, albeit rare. There are excursions that specialise in spotting the act of breaching, as the sharks propel themselves out of the water on catching their prey. Address: Hout Bay Harbour or Simon's Town Harbour.